Kohib, AKA Øivind Sjøvoll from Sortland in the north of Norway, has been an important part of the club-scene in the town of Tromsø since 1997, first as a DJ, later as a club organizer. He released his debut album "Make Fire" in 2010, with the digital only remix-compilation "Make Fire – The Remixes" released late 2011. 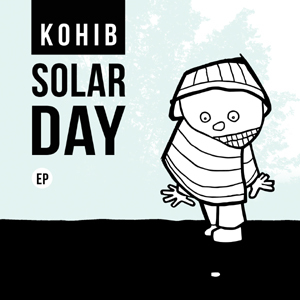 Kohib starts off 2012 with a rousing four-tracker of superb dance tunes. Titled "Solar Day EP", the selection features prime examples of Norwegian electronic music ranging from nu-disco to slinky house music to downtempo electronica. "So Good" leads the pack with a high charged house music rhythm, fancy bursts of percussion and bass line pulsations, and the appealing vocals of Dagny Norvoll Sandvik which beckon the listener to "take off all your clothes and dance with me!" This one's begging for immediate deployment on the dance floor. Kohib touches on more Italo-flavored grooviness with "Don't Tease The Bumblebee" which rides and glides like the flying insect in the title should. A bouncy low end and floating synths add to the cosmic romp. "Escape Velocity" lessens the tempo but fizzles with intriguing elements and melodies. Seemingly plucked synth lines and rolling, reverb-ed arpeggios evoke slow-motion bob-sledding across the Norwegian tundra. The set closes with the eponymous "Solar Day", a mildly uplifting piece withdriving drums, buzzy, throbbing synth action, and more delicious Italo-inspired loveliness. This one builds to a stirring climax and closes the EP in grand style. Dj Emskee (WBAI 99.5fm in NYC): Electronica CAN be good!! This is a manual for for how to do it. This is HOOOOOOT! All 4 tracks. Salute!! Rudy Kizer (WRZX (X103) FM (Indianapolis) / Hit The Decks Radio Show): super-versatile EP - tracks for warm-up, lounge, or peak hour. Supporting. Adrian Lugo (RPM DIrector) (WEFT 90.1 FM (Champaign, IL)): Dope track. Great gradual build to a funky, driving and deep banger. Awesome melody, captivating vocals, and jacking drums with just the right amount of darkness. Will be playing this for sure. DJ Nova (Rodon FM 95): You can hardly find something not intresting from Beatservice. The same title track of this Ep is my fave, Balearic vibes that mixed with intergalactic Italo Disco ones, ecstatic, full of warm drumbeats and percussions. Midtempo ''Escape Velocity'' offers tha pure Nordic electronic sound, a look outside the window, to the white dressed landscape from the warm room. Pure Italo disco ''Don't Tease The Bumble Bee'' is another highlight on EP. Ilya Santana (Eskimo Recordings / Santa Esperanza Records): Nice track Solar days, is the most i like. Psychemagik (Psychemagik / History Clock): Really love this, just add beach! ed / Rodion / Alien Alien (Gomma / Eskimo / Nang / Slow Motion): I like the sidechained italo vibe of "don't tease the bumble bee"
Gerald Belanger (nice+smooth): Really like all the tracks, 707's ahoy! DJ Chang Bang (Red Bull Music Academy): Escape Velocity is very nice, like the keyboard arrangements on it. Very nice feel to the whole EP, like the eclectic sounds. DJ Tronic (Dancefloor Mayhem Blog / KBOO FM (Portland) / Techno.FM): Escape Velocity is super deep. Also love Don't Tease the Bumble Bee. DJ Firefly (WRCT Pittsburgh 88.3FM): Great electro tracks with catchy hooks and danceable rhythms, and a nice downtempo gem to top it all off. Thanks! Velanche (Urban Landscapes Radioshow / KCPR 91.3 FM): I really like the Eurodance vibe of "So Good" and "Solar Day;" will mix one of them on my show. The other tracks are solid. B.Original (Pin Up Recordings / M4T / Blockhead): Lovely deepness here. Digging the sounds on SO GOOD and SOLAR DAY. DJ Bonehead (Heads Up + Sundada radio shows on myhouseyourhouse.net): loving the mid tempo vibes! Leri Ahel (Elektrana Radio / Mutant Disco Radio Show): Nice ep. It's all about "Solar day" for me. Lovely track. TJ Norris (Resident Advisor (reviewer) / Igloo Magazine): Something is going on and I like it. Get up and dance to this raver - just an instant party! Maxim Ryzhkov (Free Ends Multistyle Show - weekly on 16bit.FM): Awesome pack! Love it. Oh my Godddd! Art-D-Fact (Art-D-Fact Online Web-Zine / Reviewer): so good indeed! German MT (Como Las Grecas (music blog) / Ghostel Club): The first 2 tracks are awesome, greats tracks for dancefloor, Escape velocity is an ideal for flying, a cosmic-space trip; and Solar Day is teh perfect end of the EP. Great EP!!!!!! Bobi (Global Movement (daily radio show) on Club FM): Very nice package, between nu-disco to slinky house music to downtempo electronica, really like. Full support! Iron Horse (Marc de Breyne) (Pawn Shop Records): Each new tune is better than the previous, and I think that they'll continue to grow on me. Well done! Lino R. Polonio (Alkalino) (Estimativa / Audaz Recordings): will try the spaced out track "solar day" on the weekend, thank you! Derek Jones (DJ Derek Jones) (Soular Grooves Radio / KPFT FM (Houston)): Escape Velocity is right up my alley. Slow-mo dub-tempo. This is getting played on the radio asap. Looking forward to given this one a much deeper listen. Thanks! Brewster Brigham (Kiss FM): moving..!! loving the artwork... i miss hold a 12" cover and admiring the art..!! Laurent N. (12 Monthly Radio Shows: Nice 102.3 FM / House Nation Radio / Radio Sensation / NCRadio): Nice release with various kind of music. Really nice tracks. Will play & SUPPORT !!! Robin Hofmann (Dublex Inc., HearDis! ): Like "don'*t tease the ..." & "so good" is amazing, love it. Geoffroy Dewandeler (Mugwump) (Fuse FM / Kompakt / Disco 45): 'dont tease' is a real chugger. lovely. Gregorio Assandri (Cloned In Vatican / Irregular Disco Workers / Disco Volante / Mad On The Moon): Great Ep! Quality! Don't Tease the bumble bee and solar day the best! Erdelyi Zsolt (DJ SPRM) (RCKO Loud Radio / INSTANT Budapest): So Godd is awesome! Sandro Bianchi (Ibiza Sonica / Loca FM / Radio Circulo): love the complete release...amazing & evolving to dance! Patrick Balzat (Fun Radio Belgium / Radio Vibration (monthly shows)): Good bassline & groove ! Will SumSuch (Urban Torque / Seven Music): "Don't Tease The Bumble Bee" is the best title for a track I've heard in years - I'm so happy it's also a great tune too! Bonar Bradberry (Under The Shade / Needwant / Asylum Leeds/ Space Ibiza): Escape Velocity Sounds gReAt!! Tyler Withrow (RPM DIrector) (KCSC Radio (Chico, CA)): Nice and Groovy! Joel Armstrong (Proton Radio / Dot Dot Music / Gorg-O-Mish): I'm diggin this release, thanks. Robert Goodman (Radio IO Programmer / Eclipse / Billboard Reporter): Very good. DK Watts (Short Bus Kids) (Bounce House Recordings / Digitally Imported Radio (House Channel Programmer)): very 80s, but still refreshing. Mason Rothert (Below Zero Radio / Thump / Energy 92.7 FM (San Francisco)): Bad azzzz! Derek Howell (Master Lux Co / Man To Man show on Proton Radio): Solid tunes. Will try. Thanks! Benjamin Roeder (KONG / CHARLIE / SPECTACLE / GLXY / Permanent Vacation): good! Nutritious (Apt Entertainment / Brooklyn Shakedown / SpinSpinNYC / Radio : Gratitude): I love this EP.